“Please, let me play for you. You will come to appreciate so much of what has been written for the keyboard over the past 300 years. You will have some new favorite works and composers you’ll want to explore right away. 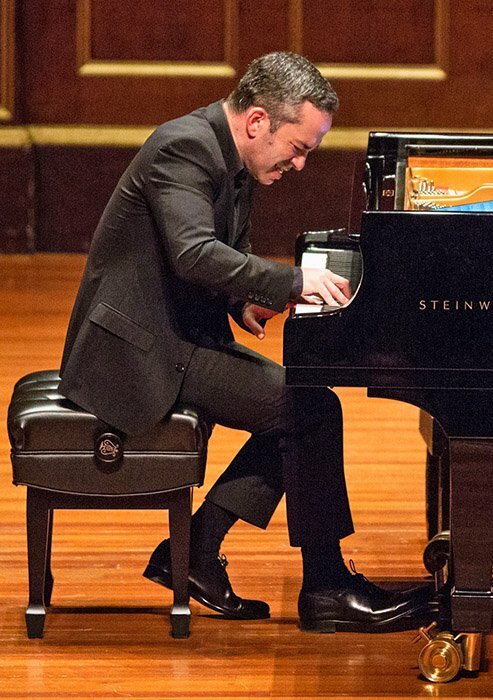 And you’ll have a splendid time, just as I will be having,” pianist Inon Barnatan seemed to say with each piece of his remarkable Celebrity Series program in Jordan Hall on Sunday afternoon. It was near perfect, not in a clinical sense, but in how the works stood apart yet came together, and in how he generated so much warmth of spirit and musical camaraderie with the audience. The Bach was rich, not brittle, and surprisingly so with almost no pedaling. Barnatan exploited the modern piano, while paying homage to its predecessors. He produced sudden volume changes, and light ornamental flourishes. At times the bass line came forward as no harpsichord could allow, showing Barnatan’s ability to voice a melodic line from any range amidst textured polyphony. It became evident early on that he was in his comfort zone; we were as quickly transported to ours. The fast, lithe (final) fugue possessed a big structural rhythm that worked to make this five-sectioned Toccata a “mere prelude” to the full suite ahead. Ah, so sweet, lyrical, and delicate was the Handel. A gem. If the Bach was a dancing stroll through city park, the Handel brought us to a perfectly manicured lawn within. And Rameau took us inside a misty, glass-enclosed garden at the heart, one full of orchids. It was mysterious, pedaled, shrouded, ornamental-laden. Barnatan’s hands were perched on high, producing beautiful voicing, articulation and micro-crescendos, all over a rhythmic foundation, always dancing. Luscious, with a gyroscopic spinning out of this beautiful little creation. Couperin’s L’Atalante? It was a small wonder, like perfectly choreographed ants marching through the garden, or so it seemed. But it just kept getting better, as these different soundscapes unfolded. What next? I’ll confess to not having enjoyed any performance of Ravel’s piano music live, ever. Spoiled, perhaps, by Gieseking. I run from performances of Gaspard. Now, I would happily attend an all Ravel event hosted by Barnatan; I’d even listen to his Gaspard. His Rigadoun was a shimmering delight. The marching ants having triggered jumping, chirping insects, so it seemed. Bright, buoyant, bouncy, delicate, and rich at the same time. Loud then soft then loud, and so appropriately cadential, with a beautiful, singing middle section. The story of Adès’s Blanca Variations is a fascinating one, worth a read here in Susan Halpern’s notes for the Celebrity Series. From those notes we learn that the work is “a set of five variations on the Ladino folk tune Lavaba la blanca niña… Adès described the folk tune as displaying ‘an unassuageable harmonic structure very typical of longing and bereavement.” Yes, this is one sad piece, ultra-Romantic turning to Baroque filigree, often sounding disjointed, not on firm ground, wandering…lost. Barnatan herein expressed deep and reflective pain and isolation, through quiet, tender voicing, deceptively delivering as an improvisation, with such a strange ending at both extremes of the register, in total darkness, so it seemed… Devastating. Ligeti’s Ricercata No. 10 became a wicked, nasty, funny, rhythmic and tonal roller coaster of a piece that turns into a demonic ragtime. Barnatan jumped all over it—knowing that if Rameau had been present, the poor fellow would have had a heart attack—right up to the final tantrum, which ends abruptly, followed by a barely audible, timid closure. Barnatan was all over the Barber, too. The fugue, or the gigue of his “Time Travel Suite,” is a real barn-burner, one that the pianist must have first digested as a teen, it seems so much part of the fiber of his being. He made it dance, with virtuosic, jazzy, and big playing. But he also revealed its delicacy, a measured pacing, and tons of rhythmic and tonal layering. It was like a sonic boxing match, full of artful jabs, with Barnatan doing much bobbing, and never missing his mark. A total blast to hear. You would be hard pressed to hear finer, more enlightening performances of these pieces any time in the next 300 years. Brahms’s Handel Variations made for a pretty wonderful 2nd half. Often, Barnatan danced at and over the keyboard, fully absorbed in his music-making. Tension and drama built as we approached the fugue. Then… it started, with good pace. The anticipation of hearing the fugue unfold raised expectations around the room. Barnatan began to speed up and slow down at different parts of the fugue, a little erratically it seemed, and this subtracted from the tension and flow. A couple times his concentration lapsed for just a moment. This might have felt like nothing, had we not experienced a close-to-perfect first half. The bell-like octaves were a joy, and the fugue came to a close. But, because of tiny moments, the variations, didn’t, in the end, come together as magically as the “Time Travel Suite.” It did make me wish that the two halves of the program had been reversed, as the cumulative effect of Barnatan’s “own” suite was, in the end (or in the beginning), greater. I would love to hear Barnatan play the Brahms again. I’d like to hear him play pretty much anything. The one encore, Bach-Petri Sheep May Safely Graze, sounded just gorgeous. Barnatan astonished us throughout with voicing within his right hand, as if had two, in addition to his left. Perfection! I was there. This review mirrors perfectly the performance. Thank you Jim McDonald. Come back soon, Inon Barnatan. The review every artist must dream of! And for those of us who weren’t there, a great impression of what must have been a memorable afternnon. Thank you, and thank you Inon Barnatan. “I was there” – it really was that kind of musical experience. Thank you, Inon Barnatan for creating it. And thanks to Jim McDonald for re-creating it as much as possible in words.